Give everyone a scare when they see the Halloween Spiders Pop-Over Centerpiece in the middle of your table at your Halloween party. 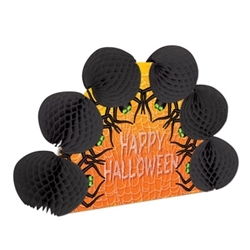 The Halloween Spiders Pop-Over Centerpiece is orange and says Happy Halloween across both sides of it with dangling spiders going across the top with there bodies made out of the black tissue that line the top of the centerpiece. We also have the Cauldron & Bat Pop-Over Centerpiece that you could use to alternate between the different tables. We also have many other Halloween decorations to choose from so you will have the best decorated party around. These colorful and very detailed pop up centerpieces are very well made and make a great display!